Last month, as part of my series on upgrades for the MacBook Pro, I covered upgrading the MacBook Pro’s hard drive to a larger model. Today’s installment in the series is also about a hard drive upgrade, but one that differs in a rather significant way: instead of replacing the existing hard drive, this upgrade replaces the optical drive. On the other hand, the big disadvantage of this upgrade is that you lose your optical drive...sort of. Since there’s a good chance you’ll still need to be able to read and write CDs and DVDs, for an additional fee of $20 the OptiBay package for the 17-inch MacBook Pro and PowerBook G4 models will include a portable, bus-powered, external optical-drive enclosure—USB2.0 for the MacBook Pro or FireWire for the PowerBook G4—into which you put your laptop’s optical drive after removal. The optical drive retains its abilities, so it can be used in the Finder, in iTunes, with Disk Utility, etc. Unfortunately, the Mac Book and 15-inch MacBook Pro use a non-standard SuperDrive that doesn’t fit in available drive enclosures. With these versions of the OptiBay kit, MCE will include a portable SuperDrive (FireWire/USB2.0, 8x, dual-layer) for an additional $100. Alternatively, with any of the packages you can get a desktop—non-portable—16x FireWire/USB2.0 SuperDrive for $120. My upgrade package included the portable SuperDrive, which worked as well as the original internal version—better, in fact, given that it was quite a bit faster. However, the need to buy a new optical drive does raise the price of the upgrade significantly for MacBook and 15-inch MacBook Pro owners. The OptiBay upgrade I tested included a 160GB, 5400rpm drive. In fact, it was basically the same Hitachi Travelstar 5K160 laptop drive I installed in the previous upgrade article, linked above. The only difference is that this one was model HTS541616J9AT00 instead of HTS541616J9SA00, meaning the drive uses an ATA interface instead of SATA. MCE offers three installation options. If you know what you’re doing, you can elect to install the upgrade yourself; the necessary tools, as well as illustrated instructions, are included. However, if you don’t feel qualified to do this yourself—especially, recommends MCE, if you have a 12-inch PowerBook G4—you can opt for one of two installation services. The Standard service, $49, requires you to send your computer to an MCE service center on your own dime. With Supreme service, $99, MCE will overnight you a protective shipping container and an overnight return shipping label. In both cases, after 1 to 3 days, MCE will ship the upgraded laptop back to you. The OptiBay sled includes all the necessary circuitry and adapters to connect directly to the optical-drive connector on your laptop’s logic board. Depending on which laptop you’re upgrading, the sled also includes some combination of screws and padded-adhesive strips that make the sled fit snuggly and stably in the spot formerly occupied by the optical drive. Once you’ve installed the OptiBay sled, reassembled the computer, and started up your laptop, the OptiBay hard drive will appear in Disk Utility as you would expect; you may need to format it after this first startup, since it’s likely formatted as a Windows drive from the factory, but after that it will behave just like any other internal hard drive. Of course, you shouldn’t try to stick a disc in the still-existent optical-drive slot; but even if you do, the sled itself will block you without damaging the disc. What you do with the extra space provided by the OptiBay drive is up to you. Some people, especially those with lots of data or the need for plenty of scratch space, will simply use the drive as storage, just as if they’d connected an external FireWire or USB drive. (You could even use one drive for Mac OS X and the other for Boot Camp or for, say, the Developer Preview of Leopard.) However, there are two other options that are also quite useful. First, if the new drive is the same size as your main drive—or if you partition it so that one of its partitions matches the main drive—the OptiBay drive makes for a great emergency backup volume. For much of my testing period, this is how I used the drive: I set up SuperDuper ( ) to automatically clone my main drive once a day. This left me with a mirror-image, bootable backup of the main drive in case disaster struck. It was also useful for testing beta software and performing dangerous system tweaks; if anything went wrong, I could just reboot from the OptiBay drive and then clone back to the main drive to restore it to a good and healthy configuration. I made good use of this setup on more than one occasion. (I should note that you should also have another backup that you keep separate from your laptop; if your only backup is inside the same computer as the main drive, you run the risk—for example, if your laptop gets stolen or falls victim to a catastrophic event—of losing both at the same time.) MCE includes with the OptiBay a copy of BounceBack Express backup software, but I didn’t test it. Indeed, in my testing the OptiBay drive fared quite well in this respect. I ran the same basic Finder-copy and battery-life tests on the new OptiBay drive, while booted from that drive, that I performed on the 160GB SATA Hitachi replacement drive covered in the previous article. The fact that the OptiBay drive uses the ATA version of that drive makes these tests especially interesting, because both drives should use approximately the same amount of power and should provide similar performance. 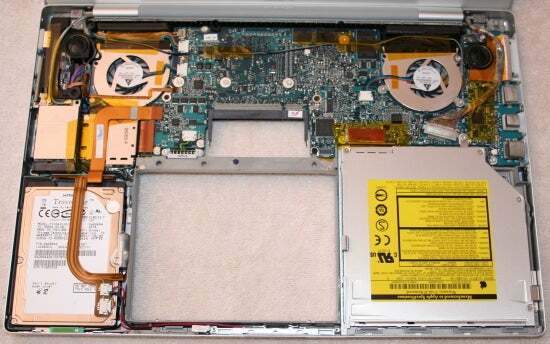 (SATA is theoretically faster than ATA, but the internal architecture of the laptop itself gives you similar maximum performance.) As with the previous tests, I erased both drives, formatted them, and then restored them to the exact same state to ensure that each would be as un-fragmented as a new drive (and comparable to each other). During testing, I unmounted the drive that wasn’t in use in order to prevent it from affecting the tests. I also performed the battery-life test while writing to both drives simultaneously—this gave me a rough idea of how much battery life you lose if you’re using both drives continuously. 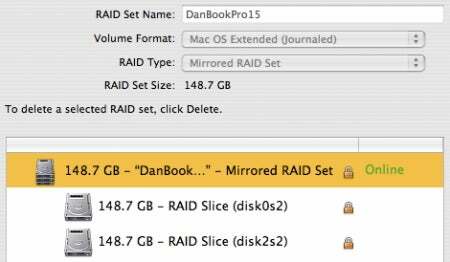 Finally, I tested battery life when the two drives (main and OptiBay) were configured in a mirrored RAID. Finder test times in minutes:seconds, rounded to the nearest second. Battery test times rounded to the nearest minute. As you can see, the OptiBay’s ATA drive was roughly equivalent in speed to its SATA, but otherwise identical, sibling. Oddly enough, battery life was actually longer, by 13 minutes, with the OptiBay drive. Just as interesting is the fact that writing data to both drives continuously reduced battery life by only around 20 minutes, on average, with a mirrored RAID reducing life by only an additional few minutes. I was surprised by these results, as they indicate that in normal use, having two internal hard drives has only a minor affect on overall battery life, unless you’re frequently accessing both drives—and even then, the hit is less than I expected. MacBook Pro temperatures with only the main drive in use (left); with the OptiBay and main drive in use (center); and with an internal RAID. Each measurement was taken after over two hours of continuous disk and battery use. Surprisingly, adding the OptiBay drive, and using it continuously in addition to the main drive, raised the MacBook Pro’s temperature readings only around 5 to 7 degrees. And RAID temperatures were nearly identical. In other words, adding a second internal hard drive doesn’t make a 15-inch MacBook Pro run much warmer. But is it for you? Now, of course, the OptiBay isn’t for everyone. For example, if you truly need an optical drive while away from home, and you don’t want the additional weight and bulk of the external version, you’d probably be better off with a external hard drive, which would be smaller and lighter (and can be left at home when you don’t need it). Basically, the OptiBay is for people who need to maximize their on-the-go hard-drive space, or who want the security of always having a bootable backup right there inside their laptop. And for these people, the OptiBay upgrade offers very good performance without nearly as much of an effect on battery life and operating temperature you might expect. Update 7/1/2007: Corrected specs on external optical drive for MacBook and 15-inch MacBook Pro.